A perfect slice, every time – our recipe for Plaited Pizza Loaf with Blue Cheese, Beets, Pine Nuts & Thyme guarantees a serving that satisfies. Smooth, cheesy and with an aroma of fresh herbs, flavours gather in a unique line-up throughout and replicates everything we love about classic pizza. Give it a go! Combine the beetroot with the olive oil and balsamic vinegar and bake at 200°C for approx. 35 min. or until tender. On a floured surface, roll out the dough into an elongated oval shape. Carefully move the dough over to a piece of baking parchment, then cut the dough along the edge on both sides moving towards the middle. 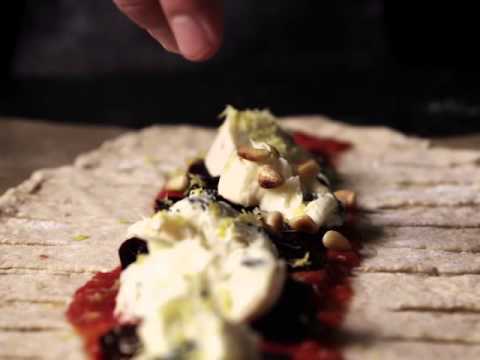 Spread tomato sauce, baked beetroot, Castello Creamy Blue cheese, pine nuts, lemon zest and thyme on the middle 1/3 of the pizza dough. Plait the pizza so the narrow bands of dough on each side cross each other. Beat the egg yolk with the water and brush the pizza dough with the mixture. Carefully move the pizza on the baking parchment over to the hot baking sheet and bake on the bottom rack at 250°C for approx. 15 min. or until crispy and golden.